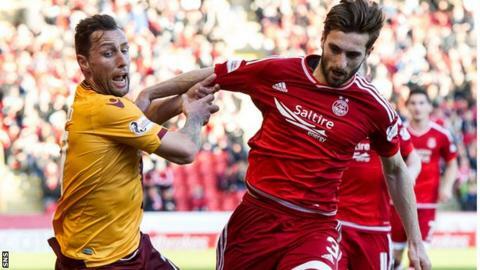 Motherwell will not ask the SPFL to postpone Saturday's Premiership match with Aberdeen, despite the outbreak of a virus at Fir Park. The club reports that most of the squad have been able to train on Friday, and are planning for the match as normal. "Majority of the squad are in to train this morning ahead of Saturday's match with the Dons," Motherwell tweeted. "On that basis, the club have informed the SPFL there will be no requests made and tomorrow's game is good to go." Motherwell were forced to postpone an under-20s game against Celtic on Tuesday after the vast majority of the squad were laid low. "We had to shut down the club yesterday," manager Mark McGhee said on Thursday. "If we had another three or four showing these symptoms and unable to train then it would leave me with no choice. "I might only have nine players including the entire under-20s. I can't go into a football match with eight or nine players." However, enough of first team squad have now recovered sufficiently to allay fears of the match being postponed.